We're hitting you with our second recipe from our deviled egg trio, and this is my personal favorite. 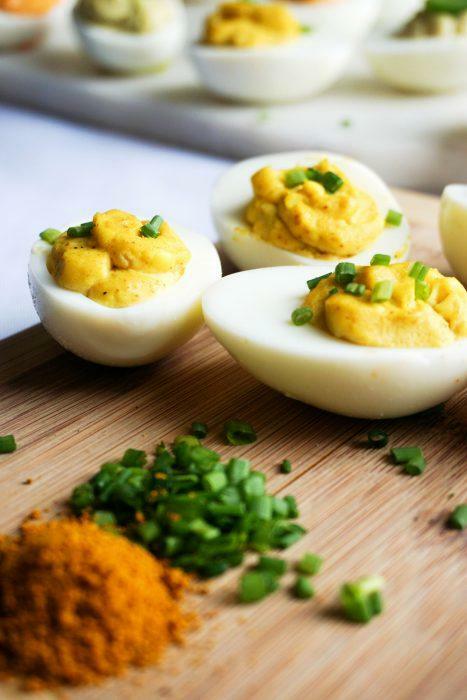 You might have been able to guess this, but we've got the easiest, tastiest Curry Deviled Eggs recipe just for you! Curry powder is something we always have in our house. We even buy a new container of it before the other one runs out. We love adding it to burgers, chicken, cauliflower and more. It kicks the flavor up several notches on any meal! What makes this recipe, and any deviled egg recipe at that matter so easy is the minimal ingredients. If you can h﻿﻿ard﻿﻿ boil an egg, you can make deviled eggs! Some recipes use mustard as I'm sure you've seen, but we've decided to omit this ingredient because we find the curry powder steals the show, and that's exactly what we want. Just a teaspoon of curry powder and your mouth is having an Indian party! The beauty about curry powder is that it is a blend of several different spices, so if you buy this one herb you're actually buying several at a cheaper cost! Making deviled eggs was always a daunting task for me, until recently. The part I was most nervous about was the yolk mixture that makes this recipe deviled. How did you know how much of each ingredient? Why did all sites have different ratios? I could never find consistency so I never made them out of fear that they would turn out bad. But, the honest truth about a deviled egg recipe is that the ratios are all up to you! No matter what you decide to use you can't go wrong with mayo and egg yolks. Throw in a little or a lot of curry powder and you're in business! 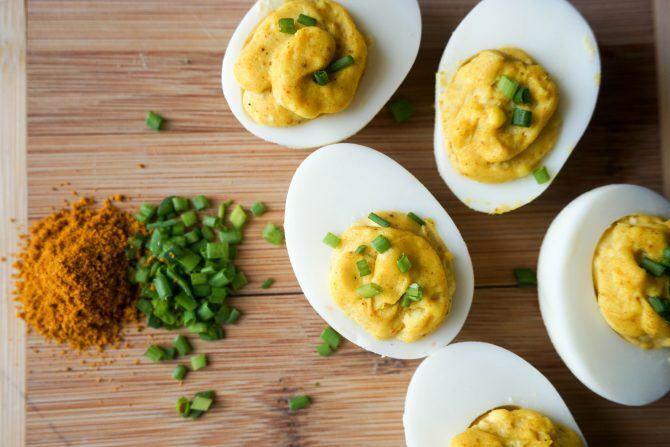 Curry deviled eggs is surely not the first recipe we've used curry powder in. It's truly a staple in our household and always an option for when cooking meals. We can almost guarantee that you'll love it if you've never tried it, and if you have, you know exactly what we are talking about! If you want to give it a try or already love it you should absolutely make our Coconut Curry Chicken recipe. Also, if you are looking for a recipe to add curry powder to we think a curry variation on our Crispy Oven Chicken ﻿﻿Wing﻿﻿s would be great! 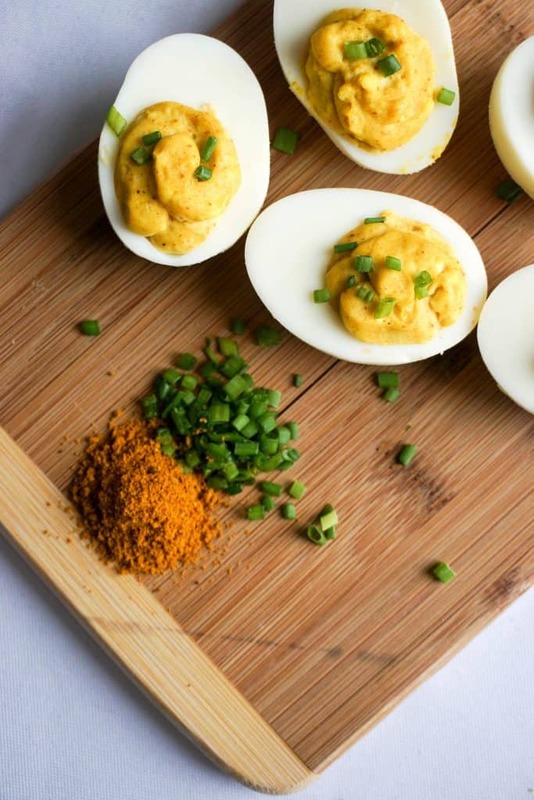 Even if you're not a fan of curry, we know these curry deviled eggs will be a hit at your next event! 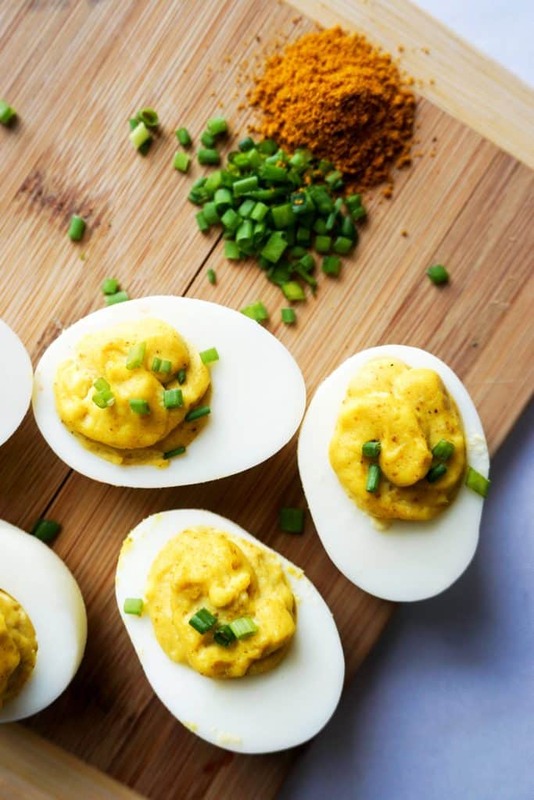 Recipe can be quickly added to MyFitnessPal - Search "KetoConnect - Curry Deviled Eggs"
Cut 4 hard boiled eggs in half resulting in four halves. Add mayo, curry powder and salt to yolks and combine well. Scoop the yolk mixture evenly into the egg whites.